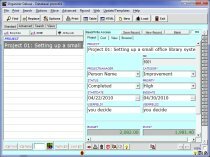 Free Project cost management template for Organizer Deluxe and Organizer Pro users. 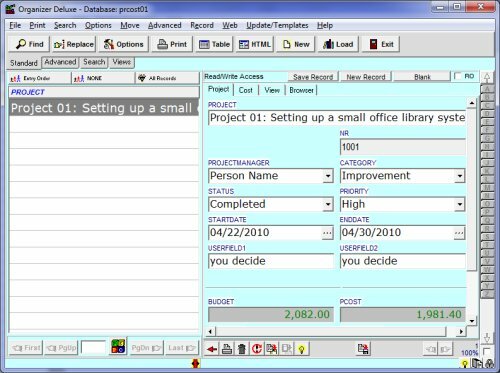 Project cost management database requested by user. You may enter the following information: PROJECT NAME, PROJECT NR, PROJECT MANAGER , CATEGORY , STATUS , PRIORITY , STARTDATE , ENDDATE , USERFIELD1 , USERFIELD2 , BUDGET (calculated from item budgets) , PROJECT COST, NOTES , COSTTABLE (item, item budget, item cost ) Total BUDGET, Total COST. easily enter cost and project data. find quickly any information: was the project within a budget? was project overdue? who is responsible for a project?